These Anti Roll Bar Bushes are specially designed for all cars that have the 'old' anti roll bar .. Original Quality Lotus Elise Exige & 2-11 Anti Roll Bar Drop Link. This fits all models. 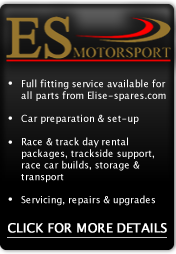 ..
Elise Spares were commisioned to test and develop these dampers for the Lotus market and are the ..
*CURRENTLY ON BACK ORDER, EMAIL FOR MORE INFO* ES Lotus Wishbone Bush Kit To S..
*CURRENTLY ON BACK ORDER, EMAIL FOR MORE INFO* ES Lotus Wishbone Bush To Suit:..
Genuine Lotus Road Spring to suit the front of a Lotus Elise S1 upto VIN W3580. We would alwa..
Lotus Evora New Genuine Power Steering Pump. Part number A132E6335S. Brand new and ready to f..
Lotus Evora New Genuine Power Steering Reservoir, part number A132E6336S. Brand new and ready..
Nitron Street Series have been offering high performance and exceptional value for money for over..